There was magic in Miami last night as people gathered under the crescent moon to attend what will prove to be one of the better concerts of the year. 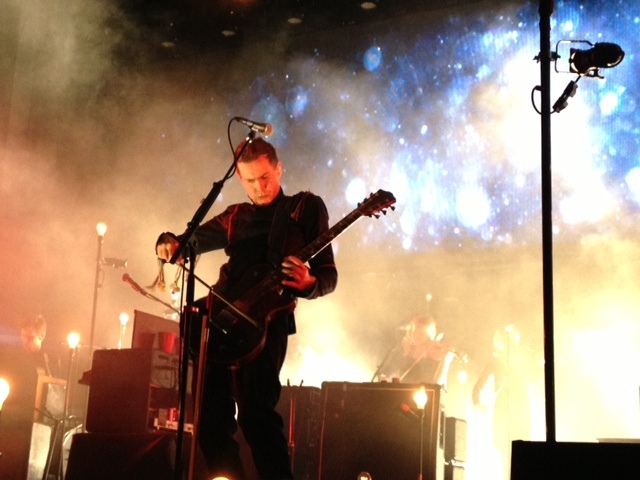 After all, it’s not every day Miami sees acts from Iceland, much less the talented ethereal soundscapes of Sigur Rós. As ambient background music played while people found their seats and places in the grass at the outdoor venue Klipsch Amphitheater, hearts started beating faster in anticipation of what was to come. The band took the stage at 8pm, with 11 members filling all crevices on the dark stage, manning the multiple instruments that littered the stage in peaceful submission to their masters. With a horn section, a percussionist, a drummer, a bass guitarist, a keyboardist, and of lead singer and bowed guitarist Jónsi, there was no doubt that the show would be lacking in sonic adventure. The show began strong, with Jónsi’s vocals being exactly what we know and love: a loud and powerful emotional sound with perfect pitch and tone. This particular vocal talent carried on through the entire evening, with not one single crack of his voice, not one missed note, not even one note out of pitch. Sheer vocal perfection, which was truly mesmerizing to witness. When they played “Brennistein,” the stage lights were actually blinding to those of us in the front row, that one had to close their eyes in order to retain eyesight. In this case, one was forced into their mind’s eye, where colors danced inside eyelids, and simply allowed Jónsi’s vocals carry them into the far reaches of their cerebellums. At many times, I felt the emotional strength of powerful singer Jeremy Enigk, however Jónsi’s interchange between whispering and throaty falsettos make him a force all his own. The band accompaniment to his vocal journey was honed to precision, with song arrangements that were complex, syncopated, and in rhythm with each moving part. The back row of musicians on stage were on point with their parts in each song. At some moments they had maracas or other percussion toys working in unison, at other moments they would throw those toys down to pick up their trumpets, flutes, French horns, and the like, in order to create depth and distraction to the moody songs of Sigur Rós. Many songs had a very classical element, with the arrangements and compositions reflecting that of a maestro. That may be the work of keyboardist Kjartan Sveinsson, as he is the only band member said to have had proper musical training. One of the horn players also doubled as a backup vocalist, whose talents were featured in a few songs. Her voice was haunting and operatic, with overtones of Enya sparkling the airwaves as she sang into the night. The drummer showcased his many talents by also playing the keyboard on one side of his drum kit. This introduction to his many talents was showcased by the melancholy song Sigur 1 (Untitled) off of their 2002 record ( ). At the end of this song, Jónsi held the last vocal note for what felt like forever, without wavering even the tiniest bit. The band also played their popular tune “Hoppipolla,” which is featured on various soundtracks and has appeared on many TV shows and even commercials. 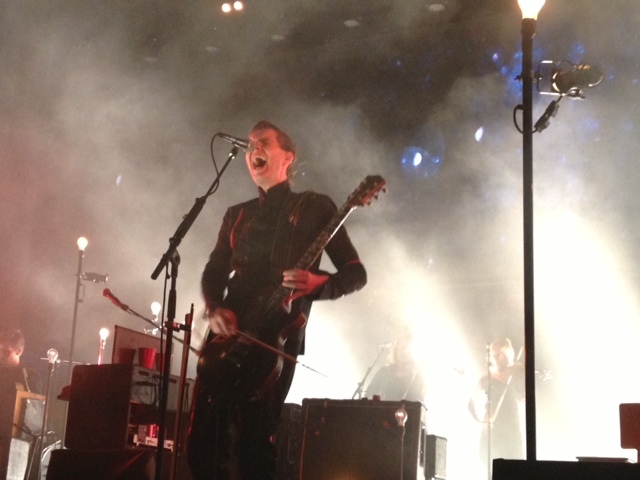 During this song, Jónsi tried to draw energy from the crowd by extending outreached arms and welcoming us in to the stage with gentle gestures of his hands. The crowd responded, however I feel this would have been more successful if they had acknowledged the crowd up until this point; He did not say hello to the crowd once, and we were already an hour into the show. Tracks like “Stormur” had emotional grandeur that was truly moving, and a sensory experience paired with the visuals they had projected on a panoramic screen behind them. Images that were sometimes open to interpretation, and other times reflected moments of pure joy, like little girls dancing in circles, or children running up a hill. Reflections of childhood, happiness, when things were “simple”… Other ambient touches were light bulbs on long stands much like a microphone would be, littered around the stage. These would flicker on and off depending on the intensity of the music. 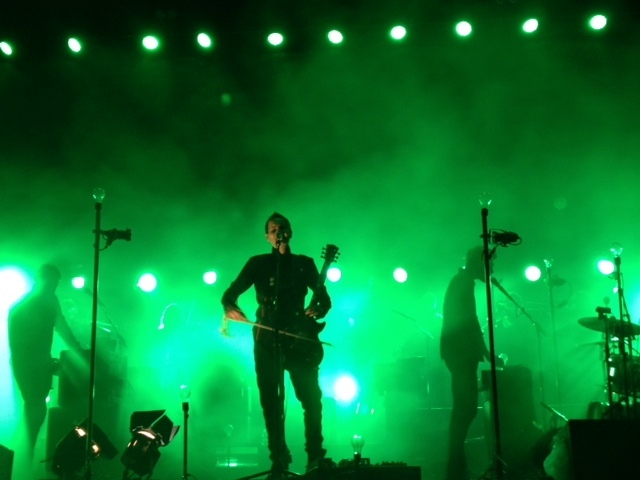 Toward the end of the show, Jónsi finally began interacting with the crowd, by coming to each side of the stage and genuflecting with his guitar and bow, playing intensely toward the audience, until he began knocking over the light bulbs in the front of the stage. It was at this moment that people got up and the band broke into a little dance party section of the song, and everyone went wild! People were dancing with large smiles, and it was obvious everyone’s heart was full. At the end, someone in the crowd even threw a stack of glowsticks! 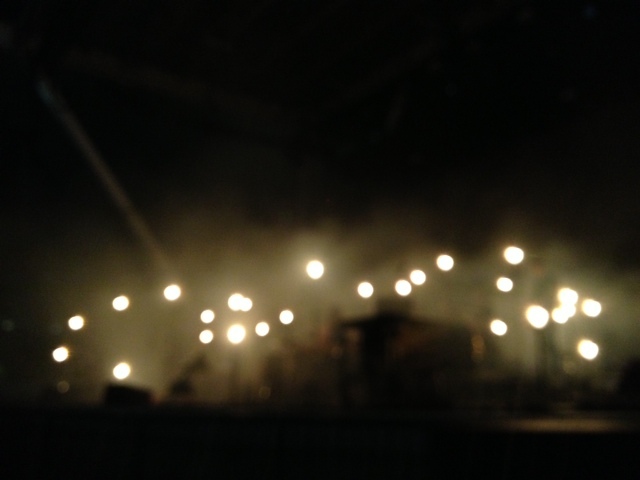 Jónsi finally said hello to those of us who traveled to see their show tonight, and ended the evening on a high note. 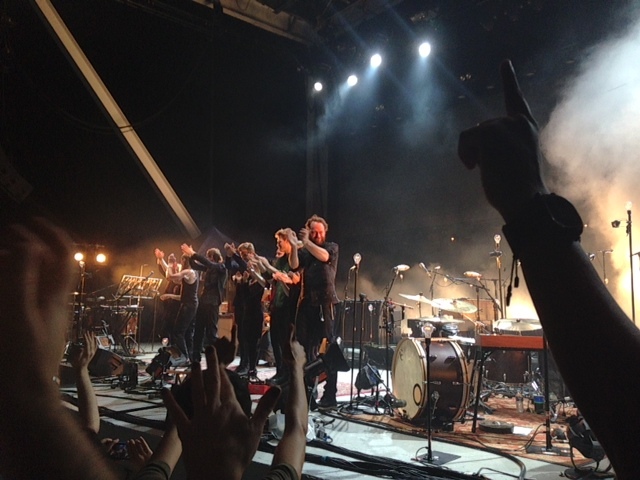 In its final moments, the band came back out on stage to take a bow in unison. Everyone in the front rows ran up to the barricades along the stage and thanked them just as much as they thanked us. It was a beautiful end to an unforgettable evening. Sigur Rós is a production that will change the way you feel about life, with its atmospheric ambience paired with post-rock darkness, it will move you in ways you didn’t know possible. Uważam że pieniądze to normalna kolej rzeczy w życiu, a zawód muzyka to zawód jak każdy inny. Nie widzę nic złego w interesowaniu się? zarobkami czy to lekarza, informatyka czy muzyka. Jeśli ktoś gra w kapeli i byłby skłonny podzielić się swymi odczuciami byłbym bardzo wdzięczny.